The Solar Direct Drive refrigerators are be­ing prioritised to be installed in communities that have no access to elec­tricity. Minister for Health and Medical Services Rosy Ak­bar last Friday launched a Solar Direct Drive (SDD) Re­frigerator and Fiji Immuni­sation Week at the Nayavu-i-Ra Nursing Station, Ra. 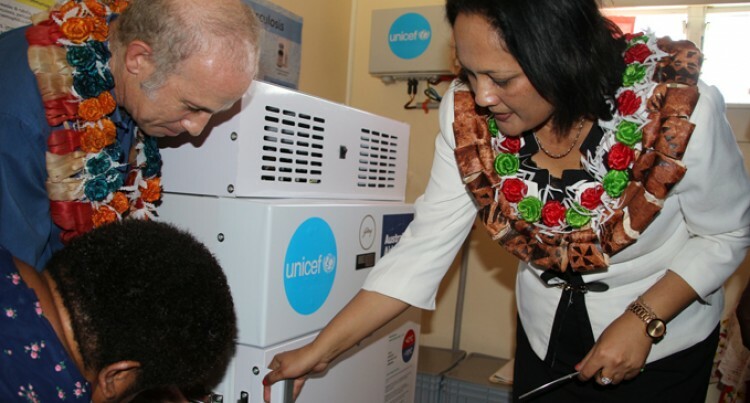 “We are officially launch­ing one of the first 74 Solar Direct Drive Vaccine fridges in Fiji, and one of the seven­teen power packs, sourced and installed through UNICEF and Australian De­partment of Foreign Affairs and Trade (DFAT) support,” she said. The 74 solar direct drive vaccine refrigerators and 32 ice-lined refrigerators (electrical) were procured by UNICEF through DFAT Australia’s support. “In order to provide pow­er to health care facilities without electric grid access, UNICEF also procured 17 solar power packs that al­lows for the use of portable lights, laptops and mobile phone charging in some of our isolated stations one of them is here in Nayavu-ira Nursing station. “The procurement of the vaccine fridges, solar pan­els, power packs, freight and installation cost totalled a little over $USD640,000,” she said. Ms Akbar said through support of UNICEF and DFAT, sustainable, cheaper, reliable and environmental friendly solar technologies are being used in Fijian healthcare facilities. “Fiji is now blessed with excellent renewable energy resources such as solar which undoubtedly are one of the best in the world,” she said.